Oliver Land was where Derek and Jeannie Tangye first saw the cat Oliver. He then appeared to be living wild and they watched as he pounced on some little creature, missed, and in the nonchalant way of cats proceeded to wash himself as if he did not really want to catch it anyway! This was around the time when Oliver decided to move in with the Tangyes. Oliver Land lies across the small valley to the East of the cottage and consists of the Clover Field, Blackthorn Alley, the Ambrose Rock and the Honeysuckle Meadow where Derek and Jeannie’s ashes were scattered. Access to Oliver Land is nowadays from the coastal path by means of a new gated entrance. There is no through route to or from the Winding Lane. 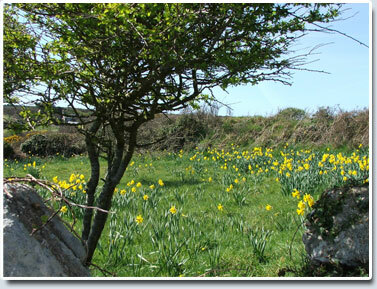 The owners of the lane and Derek’s neighbours tolerated access during his lifetime but in legal and practical terms Oliver Land Nature Reserve is land-locked apart from this entrance from the coastal path. A general ‘through route’ to the main road would negate the object of ‘A Place for Solitude’ and it’s inevitably quite intensive use as a public footpath could in consequence disturb the wild creatures. Oliver Land “must be preserved”, said Jeannie, “for the natural inhabitants, the multitude of wild creatures, insects, butterflies, foxes, badgers, nesting birds. It mustn’t be preserved for human beings, except those who seek Solitude”. TAKE NOTHING AWAY, LEAVE NOTHING BEHIND. Where life continues and Death is never”.